The late nineteenth and early twentieth century was an amazingly fertile period in American art. Between the 1870s and 1890s, thousands of American artists went to Europe to study art. This included the likes of Mary Cassatt, John Singer Sargent, Childe Hassam, James A.M. Whistler and so many more great names in American art. These artists learned about the latest European styles and subsequently brought their learning back to the US. Impressionism, Post-Impressionism, Japanese Ukiyo-e woodcuts, and the Arts and Crafts Movement were major forces that shaped turn-of-the-century American art, and actually paved the way for modernism in the US. 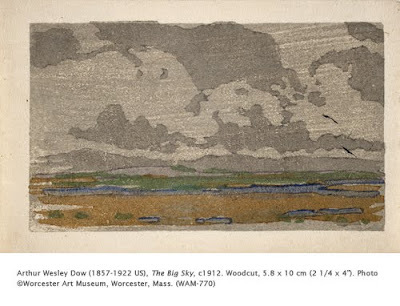 Arthur Wesley Dow is credited with helping to introduce the Arts and Crafts Movement in America. Looking at the prints and paintings of Dow, one can see the strong influence of the Post-Impressionists and, especially in his prints, Japanese woodcuts. This particular work shows an affinity to the suggestive, open compositions of Japanese prints. Dow was especially drawn to Japanese art because of the emphasis not on perfection, but rather beauty in a finished artwork, especially in utilitarian art. This coincided with the Arts and Crafts insistence that art and utility be wed in all art forms. These ideas formed the basis of Dow’s teaching: no matter what was created, whether a basket, a bowl, or a painting, the result had to be beautiful. After returning to Ipswich, MA in 1889 after studying art in Europe, Dow began teaching art and producing and selling his own prints and paintings in Boston and Ipswich. In 1891 he opened a summer school where he offered courses in painting, printmaking, photography, ceramics, basketry, and other miscellaneous arts. His insistence on beautiful design, no matter what the medium, meant that no one art form was given more precedence over another, unlike the conservative art academies of the earlier nineteenth century in which painting was favored. The summer school lasted until 1907 and attracted many famous artists, including photographer Alvin Coburn and artists from the famous Newcomb Pottery studio in New Orleans. Dow subsequently taught at the Pratt Institute in Brooklyn (where Georgia O’Keeffe, Gertrude Kasebier and Max Weber were his pupils), and Columbia University’s teacher college. In 1899 Dow published Composition, a resource book for artists and educators that quickly became a handbook for art education in the early 20th century for elementary, middle, and high schools. Many of Dow’s pupils (including many women) were inspired to become art teachers themselves, and spread Dow’s art education theories across the country. Take a look at some more of Dow’s beautiful prints. I really enjoyed your blog… You always have great information & inspire me as an educator & artist!! !